Each one of us has been given the greatest gift of all – the gift of life. On this earth we are given opportunities and it is up to us to take them and make the best of every situation. If our society is to function well then each one of us has to take responsibility for our actions, and make a positive contribution to our society. The government and the politicians are not responsible for any of us – we are responsible for ourselves, our thoughts and our actions. Running a government can be likened to running a ‘stokvel’. The members of a stokvel elect the leaders (office bearers) – this is like the general election when we elect the leaders of our country. The members of the stokvel make a contribution to the ‘money bag’ (this is the same as the citizens to contribute their taxes to the government). How the money is to be used is negotiated by all the members of the stokvel and each member has to abide by the rules (the laws that are made by parliament). In a stokvel, the only money that can be used is the money that has been deposited by the members, and only used in accordance with the rules of the stokvel. The only money that a government has is the money that is collected by SARS from the taxpaying citizens of the country. If you are not a member of the stokvel and you do not contribute to it, you are not eligible to claim from it. If the money runs out then there can be no further spending. We all understand the functioning of a stokvel but it would seem that we do not all understand the functioning of government – the income and expenditure. We are developing a society when the general population feels that the government must pay for everything – free medical attention, child grants, various pensions and grants, feeding schemes, free education, just to mention a few. The huge question is – from whence will the money come? Jobs are scarce – when you are employed, or self-employed (as a farmer) then you contribute to the economy – you pay VAT, and income tax, and the fuel levy etc. However, if you are not financially active, then you are not making a positive contribution to the country. We fear that we are reaching a point where the government (like a stokvel) will simply not have the money to pay for everything. What will we do then? How will we stop the mass action of the dissatisfied and disillusioned members of our society? Let us take responsibility for our lives – our choices, our children, our families and our society. Ultimately the individual is the smallest unit of our society and each of us has to make a conscious choice to become an active part of our economy and a responsible citizen of our country. 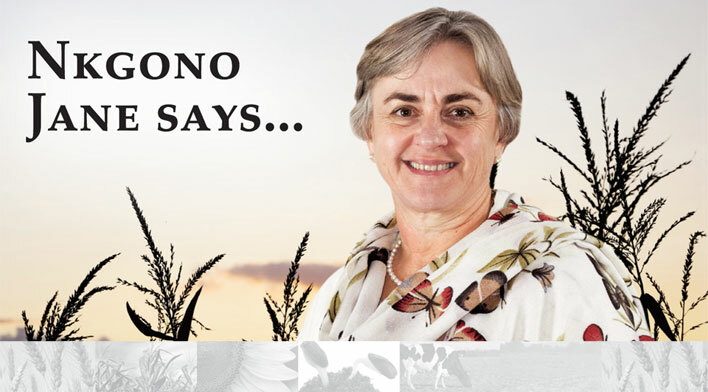 Keep farming – you are making a very valuable contribution to South Africa.